The new major release ‘6’ of LibreOffice was made available almost two weeks ago but I have been struggling with the 32bit build. Despite the fact that my 64bit -current packages for libreoffice-6.0.0 were online for a short while (almost nobody noticed), I did not have anything good to share so I removed those again. And in the meantime, faster than scheduled because of some serious regressions and a security report, I noticed the release of version 6.0.1 two days ago. I had been busy with new Plasma5, VLC and GCC packages but with those out of the way I set myself again to the task of fixing the 32bit build. And I nailed it, so now I can finally announce packages for Slackware 14.2 and -current. gpg-based document signing & encryption, yay! The Document Foundation has also recorded a video summarizing the best new features of LibreOffice 6. i invite you to take a look at it. I have also added this release of LibreOffice to my just-uploaded PLASMA5 Live ISO which is based on Plasma 5.12 LTS. Posted: 11 February, 2018 in Slackware, Software. Wow, have you been busy!!!!! Many thanks. Works as advertised. 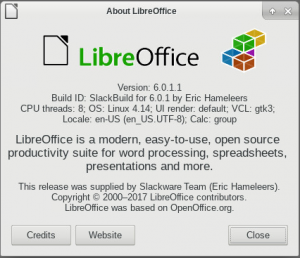 Upgraded libreoffice-5.4.4 with version 6.0.1 on my Slackware64 14.2 + Multilib Laptop. Works very well for my use-cases. I know it is never enough, Eric, but thank you again! Great to see you’ve been working on the 32bit since that’s what I use. Thank you so much, Eric. I’m so pleased there are people like you out there working hard to support 32bit archs. Thanks for all the great job alienbob! nik what version of Slackware are you running (14.2 or -current) and what is the URL of the package you downloaded and installed? I hope this info is helpfull. Using the 32-bit current version with the quickstarter in the systray…..
Can be “cured” by restarting the desktop (LXDE). Similar to, but not the same as previous LO/glib2 problems. nik if you are running Slackware 14.2 you should *never* use packages in the “current” directory of my repository… there’s a “14.2” directory to which contains the package that works with Slackware 14.2. The libreoffice I compile on Slackware-current simply won’t work on 14.2 because of all the incompatible library updates that occurred between the release of 14.2 and today’s state of development in -current. Thanks for clarifying that alienbob! Occasionally I have used packages from -current to my system without problems. nik, you have already upgraded several other packages to “current”,like glibc and gcc. It may be wise to review your installed packages and revert *everything* to Slackware 14.2 packages. Else you will keep running into missing library issues and/or application crashes. I am now aware of that (thanks again for noting) and will do so! Keep up the great work and many thanks again for your overall efforts. Hi Eric. Thanks again! Works like a charm! Hi Erik, thank you for making packages of the latest LOO. On Slackware64-14.2+multilib, LOO 6.0.1 (for 14.2) installed with slackpkg+. However, when attempting to verify java set to openjdk8 LOO is crashing when clicking on Tools>Options. Tested with multiple odb files. Crash doesn’t happen with LOO 5, but with LOO 5 the automatic filters is so slow I can’t use it. Don’t have the crash in AOO 4.1.5. Any suggestions on how to investigate this crash? Thanks. When clicking tools>preferences the app crashes. LibreOffice(19580) KSambaSharePrivate::findSmbConf: KSambaShare: Could not find smb.conf! I’ m running stock x86_64 14.2 + multilib with slackpkg+ for pkg managment. Make sure all the other lines start with a ‘#’. Then logoff, login again and see if that makes libreoffice work. Still when clicking tools>preferences the app crashes and restarts. What is the name of the openjdk (or openjre) package you have installed? Hi Eric, I have openjdk-8u151_b12-x86_64-1alien installed. Well, same here. Take an alternative approach: create a new user account on your computer, login as that new user, start libreoffice and go to tools>preferences. If it does not crash you’ll know the issue is in your own user’s profile. If it crashes, it is a systemic issue. In that case, try another desktop environment (XFCE instead of KDE for instance) to see if that makes a difference. Et cetera, keep trying a single parameter time after time until you find the cause. Eric, login in to another user did the trick. No crashes in KDE and XFCE. So there’s a problem in my own profile. Also tried XFCE but also crashes. Should I delete ./kde , etc? Thank you!!! work pretty good here. Hello. Same problem here (tools>options and crash), Slackware 64 full install (but with a newer kernel 4.14). Problem remains regardless of desktop (Xfce, KDE, Wmaker, FVWM). Tried /etc/profile.d/libreoffice.sh (uncomment each time and a different option). No luck either. Removepkg libreoffice* and all user’s setings (rm -r ./config/libreoffice). Did not fix it. Login as a different user. Works. Tried it in a different computer, fresh installed slack 14.2 64. LO was the only additional package. Worked. Starting LO in Safe Mode, tried some options there, did not help. Just wondering, if there is a fix, or something for else to try -apart from creating a new user. LibreOffice does a lot more than just reading and writing in ~/.config/libreoffice/ – like, accessing the files in your “recent documents” list, accessing desktop theming configuration etc. That is a lot of files in your homedirectory which a freshly created account does not (yet) have. Do you plan to build LibreOffice 6.0.2? No idea. No time now. There’s lots of other stuff too that needs an update. Real life takes precedence at the moment since package building does not pay the bills. Following the advice, i tried with — strace and i found that the crash occurred when lo was accessing /home/thym/.gnupg folder. After i removed that folder, lo seems to working flawlessly! (of course i ll keep an eye on it for the next couple of days). thim – I too have a ~/.gnupg folder containing my private and public keyring… but LO does not crash accessing the tools>options menu. Is there someting amiss with the directory access rights and ownerships? Does that directory actually contain a GPG private/public key pair? But I am glad it works at least, without the need to create a whole new user account. Can confirm removing .gnupg did the trick. LO is working great now. When running “$ lowriter -strace ” no log is generated in my case. drwx—— 4 cesar users 4096 mar 6 19:00 .
drwx–x–x 76 cesar users 12288 mar 6 18:58 .. They are broken after latest boost update in -current. That what happens regularly if you decide to install -current instead of a stable release… either you wait for me to compile new packages or you recompile them yourselves. From time to time I chase regressions in LibreOffice and sometimes submit very small patches. For a long time I have had a working clone of the source code sitting on my 14.2 production machine. Always compiled with –enable-kde4 because I use, on my production machine, kde4. Trying to compile libreoffice, with –enable-kde5 on a development machine with current and your ktown installed, but I getting errors. I’ve looked at you libreoffice.SlackBuild and it looks to me that you chosen to compile with either –enable-kde4 or –diasable-kde4. Have you attempted to compile with –enable-kde5 and found that it doesn’t work or have you another reason not to use –enable-kde5? I think the Qt5 / KDE Frameworks5 support was added to Libre Office 6.0.0. However: since there’s no such thing as “KDE5” in Slackware-current I saw no point to enable this feature. I will consider it on the next package build though. Thread 1 “soffice.bin” received signal SIGSEGV, Segmentation fault. If I remove the gpgme system package, then the crash in libreoffice goes away, however course this breaks other things. I’m not sure if the recent versions of libreoffice will build with gpgme-1.6.0 for the sake of compatibility with 14.2, but perhaps an environment variable can force libreoffice to prefer the included libgpgme? bl0tt0 if you find a way to compile LO against gpgme 1.6.0 send me the patch. Otherwise you’re out of luck. It has already cost me many long nights without any success to find a solution. I won’t spend any more time on it. bl0tt0 – nice find. I had not ran into that bug report before. I guess I will have to compile LO 6.0.5 then. Hi Eric, I guess you are probably aware that the latest Slackware updates have broken your LibreOffice package again. Libboost seems to be the villain of the piece this time. I’ve worked around it with an awful kludge, but the real answer is to recompile. Looking at your slackbuilds on slackware.uk, the latest seems to be for 5.4. You’ve implied in the past that there are issues with building Libreoffice for Slackware, so will this older slackbuild work if updated to reflect the current version 6.1, at the time of writing, I think)? Or do you have an update in the works? Pete, the latest libreoffice.SlackBuild is for 6.0.5, not for 5.4. I have just finished compiling a whole new ‘ktown’ release for Plasma5 which I am not allowed to release before thursday (Applications 18.08 release day). With that finished I am now working on a package for LibreOffice 6.1.0 for slackware-current to fix those boost library issues and bump the package to the latest release at the same time. as with every bump in the LibreOffice release I am running into trouble and it may take a bit to get to a working package. Hi, I`ve a problem with LO 6.1 for both slackware & slackware-64 : if I use calc and want to change a column width .. it shows completely crazy values. I tried to delete the libreoffice settis folder in my home directory, tried to remove and to reinstall the package … nothing, the problem is present. I`checked using other linux distro and there that problem is not present. Just finished to download LO 6.1 Appimage file. Executing it on my slackware64-current the problem I`ve reported is not present. and that was the end of the process. Patrick, why do you want to compile LibreOffice from source instead of just installing the package from my repository? If you want to compile from source you need to install the build dependencies first. They are: JDK version 8, Apache Ant and perl-archive-zip. Obviously you do not have a Java installed, hence the error. My advice: use pre-compiled packages and do not try to compile from source if you do not know what you are doing. Foolish me, I thought I was just installing it. Is there a simple step-by-step available somewhere? Many thanks Eric. I’ll do that! I made a further attempt, using the package this time. Unfortunately it installed but doesn’t work. What’s the best way round this? Sorry if this is all dealt with in one of those documents you mentioned, but I thought I might say that I’m probably better suited to a more enduser-friendly distribution! I also tried to install vlc, and had no luck either …. Patrick, I assume you are running Slackware 14.2 which contains zlib-1.2.8. Every Slackware stable release receives security patches over time, and those end up in the “patches” subdirectory of the repository. You really should apply those security updates on a regular basis.